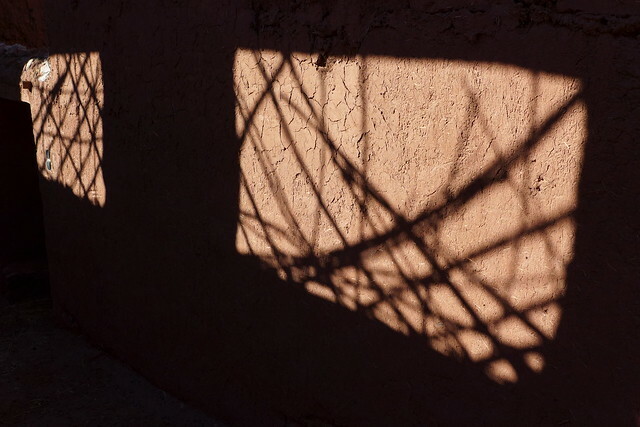 Morocco really is a country of light and shadow. Just when our hearts are all open and our minds full of a wonderful exchange, we get thrown right into the opposite direction. The emaciated farmer who partook in our lunch turns out to be a bit of a chancer. As we are about to leave, we ask him if he knows of anywhere we could buy wood. I can give you some wood. Ah, great, how much does it cost? No, no, it’s a gift, come with me to my house. So we drive the few hundred meters to his land and then walk across the hills to his house. On the way he tells us of his plans to make the house nice, to plant olives and almonds. How does the damming of the river affect him? It’s great, he says, I can have as much water as I like, it’s not creating any problem. It’s great that the Europeans and Chinese help us to build this dam. We prick up our ears – Europeans and Chinese? It turns out there’s been over 70% foreign investment, according to our farmer. We need you Europeans, he says. We try to tell him there’s no such thing as altruism on this kind of scale, what’s the hook? What do they want in return? Nothing, he says, just the Chinese want the rights to the mines nearby. There are a lot of minerals here that are needed for modern technology – Cobalt and Barratine among them… And the Europeans? We don’t get an answer on this question but a few days later, someone mentions the larger picture. Morocco has a great leverage over Europe by promising to police the tide of immigrants across the sea, or not, as the case may be. We don’t know whether the funds for a reservoir would be part of a barter on a grand scale, but what we do know is that all the Moroccans we have tried to barter with were highly skilled at negotiating a good deal for themselves. We don’t know if it’s a good thing or a bad thing to have a reservoir, we are by no means informed enough to have the full picture. But to return to our farmer – after having offered us semi-precious stones and firewood, he accompanies us back to the van where he charges us 50 Dh for the wood. I’m caught off-guard… I thought we’d had an equal exchange in friendship, and he’d been adamant that these things are gifts. We want to move on, so we pay the money and go, but this encounter rankles with us. We have no issue with paying for firewood, we understand very well that as there are hardly any trees around, it’s in high demand. I did initially offer to pay and he refused. Now that the wood is by the van, he wants money. It’s also obvious that he is really poor – the meal he had with us was probably his first good meal in a while. So it’s hard to refuse a payment that isn’t really that much in the grander scheme of things. But – it’s the retrospective changing of a relationship that is not good. It makes us mistrusting of the next person who seems to be making a generous gesture. If I’d had enough presence of mind, I would have started a conversation with him, explaining how this feels uncomfortable for us and ask him why he refused the money when I offered to pay. And last, but not least, I’d like to ask him if he really wants to change our relationship in this way. He saw us giving Bassou our card with email and phone etc. so he asks if we can exchange phone numbers, but I refuse. He backs off. I think he has noticed that he’d pushed too hard and overstepped a boundary. Sadly, we both lose out in this kind of encounter. Luckily, so far, we have met many more ‘Bassou’s on our journey than people on the make.